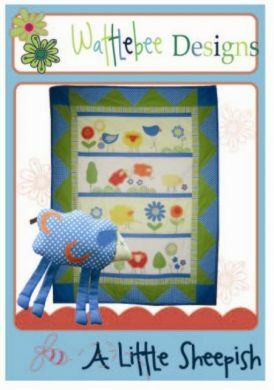 An original design by Deb Gardiner this Nursery Quilt and Toy uses simple techniques for young mums to decorate their nursery. Bright and cheery, there are many fabrics suited to this style of quilt. Pattern includes full instructions for the quilt and the accompanying soft toy. All fabric amounts based on 44 inches(112 cm) full width.. Backing fabric: 150cm Batting ( light –med weight :150cm ( I used bamboo batting) Lemon tone on tone: 50 cm – for Quilt panels, toy head & appliqué Cream Homespun: 50 cm –for panels & appliqué Vertical stripe: 30 cm – for 1st side border & appliqué. Green Homespun: 60 cm – for side panels (triangle appliqué) & appliqué. Bright blue homespun: 100 cm – for sashing, toy’s legs, binding & appliqué. Bright Blue/white spot: 50 cm – for triangles, toy body & appliqué Small amounts of the following (or fat ¼’s) for appliqué: Bright orange print & lighter orange/white spot, approx 10 cm Mix of yellow – print ( approx 15 cm - larger sheep)& white spot -10cm. Marbled green –approx 10 cm for tree, leaf & shrub appliqué. Embroidery threads – DMC #471 & #936 (greens), #806 (blue), #741 (orange), #413 (dark grey) & black - small amounts required for appliqué detail. Embroidery needle. Vliesofix light-med weight: 90 cm ( 90 cm wide used). Iron-on med weight Pellon: 10 cm for toy. Scrap of ½ inch wide black ribbon/braid – for sheep’s tail. Polyester stuffing for toy Template plastic or cardboard & marking pen Matching sewing threads for quilt top and backing (bobbin) Iron Fray Stop (optional) Sewing machine attachments: free motion, walking and ¼ inch foot (optional) Quilting mat, ruler and cutter Pencil or chalk Teflon appliqué mat or baking paper (optional) General sewing equipment.